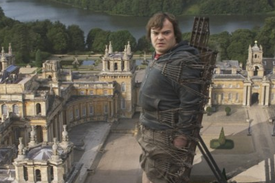 In case gigantic advertisements showcasing his crotch didn't give away the season's already poorest-kept secret, Jack Black stars in the new movie Gulliver's Travels, which opens Christmas Day. Black plays Lemuel Gulliver, a travel writer who ends up on island where he literally towers over its inhabitants, the diminutive Liliputians. But notwithstanding the film's computer-enhanced gigantism, the comedian and actor has enjoyed a number of big roles before in his career, albeit one that are big for reasons other than his size relative to his co-stars (although that does remain true in a couple of cases). As such, we've compiled a list of his top five biggest roles that required absolutely no CGI—at least not on his part, anyway. Jack Black had done only a few small roles prior to working on Tim Robbins' directorial debut, but his collaboration with the fellow UCLA alumni worked out particularly well. As a governor's son who becomes obsessed with Robbins' conservative political candidate, Black communicates manic if considerably ignorant passion, creating one of the first portrayals of his now-familiar on screen persona and introducing himself to the moviegoing public. After a series of supporting turns in movies like The Cable Guy, Mars Attacks and The Jackal, Black made his biggest big screen splash to date playing Barry, an obnoxious music clerk who managed both to steal scenes from John Cusack's main character, but provide his music-obsessed world with more than a little know-it-all verisimilitude. Although like Bob Roberts, High Fidelity was only a minor commercial success, it allowed the supporting player to cross over fully into the mainstream and make his first few steps towards A-list stardom. The combination of Black's natural mania and the Farrelly Brothers' equally balls-out approach to comedy seems even now like a natural collaboration, but the Farrellys enlisted the comedian for a markedly different sort of role. Playing the title character, a good-natured but superficial guy who receives a dose of common sense from an infomercial superstar, Black stretched his acting muscles and showed that he could be more than a guy with crazy eyes and a crazier sense of humor. It's this subtlety and dimensionality that allowed him to go on to romantic lead roles like the one he later played in The Holiday. If Shallow Hal showed how Black could be different and could, if necessary, prove himself as an actor, School of Rock made him a star simply for being himself—at least, the himself he presented in most of his movies to that point. Playing a failed musician who transforms a classroom full of kids into his latest backing band, the comedian offered perhaps the purest and most likeable iteration of his public persona to date, and the film indisputably made him a movie star. After that, he seemed to align his comedic charms more easily with mainstream moviegoers, and it was this performance that produced the affection that continues to fuel his career. When Peter Jackson cast Black as the consummate showman Carl Denham, seldom has a character and actor seemed more perfectly suited to one another. But Black turned out to be one of the film's weaker links, as he seems unsure how best to bring his character to life and yet keep him at least marginally charming. Critics and audiences raked him over the coals for his performance, and the film's overlong running time only exacerbated the discovery that audiences had by that point maybe seen a little too much of the funnyman at the movies. Indeed, it may be because of such a high-profile backlash that the actor didn't take on another full-fledged starring role (as opposed to featured performances in ensemble pieces or leads in smaller fare) in a big movie until Gulliver's Travels.